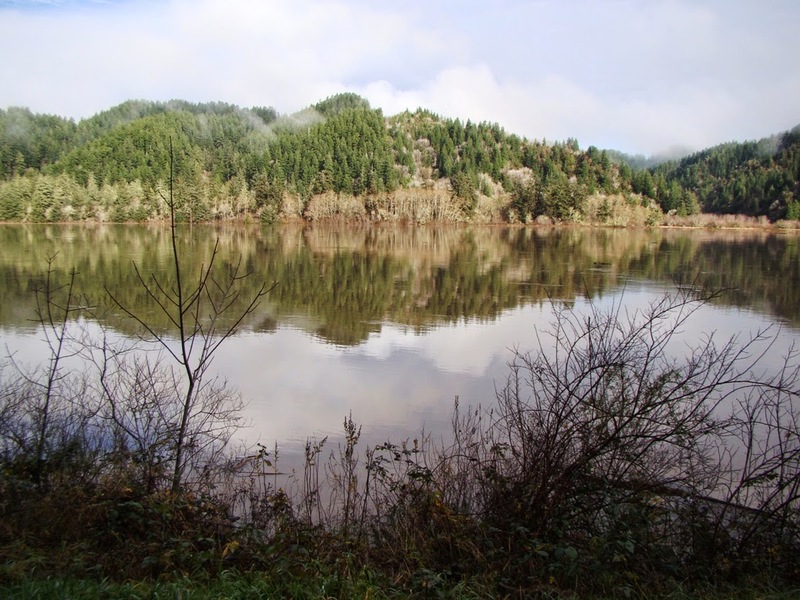 Geotripper: A California Geologist Observes a Flood in Oregon: Hilarity Ensues? 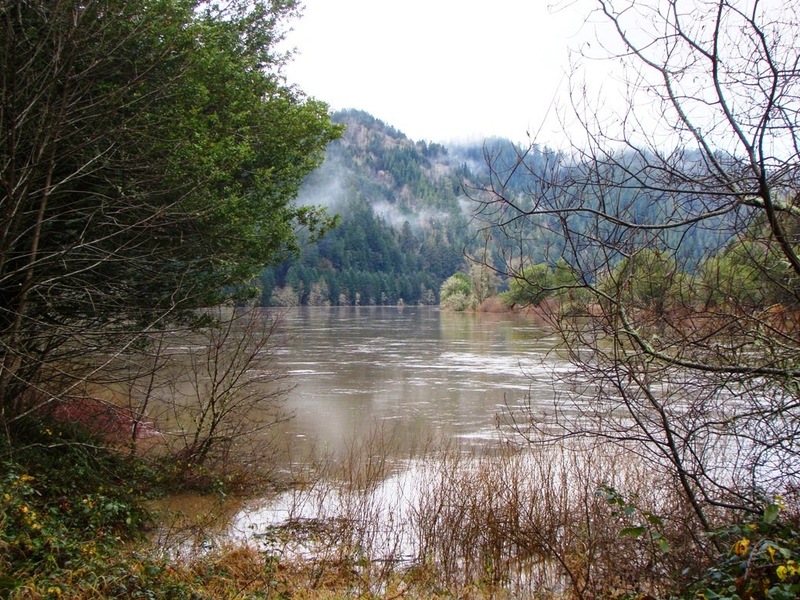 A California Geologist Observes a Flood in Oregon: Hilarity Ensues? I'm really more of a desert rat. I hail from a dry valley in California, I take my students on extended field trips to places like Death Valley and the Colorado Plateau. The rivers that I know would be considered something like large creeks in a place like Oregon or Washington. I just don't see stuff like this where I live. I've been traveling up the California coast into Oregon, and landslide problems forced us inland from the coast onto Interstate 5, and with the long day and the extra 200 miles added to our itinerary, I just flaked out and stayed the night in Roseburg along the Umpqua River. As noted in yesterday's post, the river reached flood stage last night, but just barely, rising a foot above the minimum considered to be a flood. But the amount of water! At the peak, the discharge at Elkton a few miles downstream was 131,000 cubic feet per second! Here's why this is so ridiculous to me. In 1997 the Tuolumne River, which flows near my home, experienced its greatest flood in recorded history, with a peak flow of about 70,000 cubic feet per second. It could be such a rarity at that level that another such flood has but a one in three hundred or four hundred chance of happening in any given year. In other words, quite probably not in my lifetime or yours. 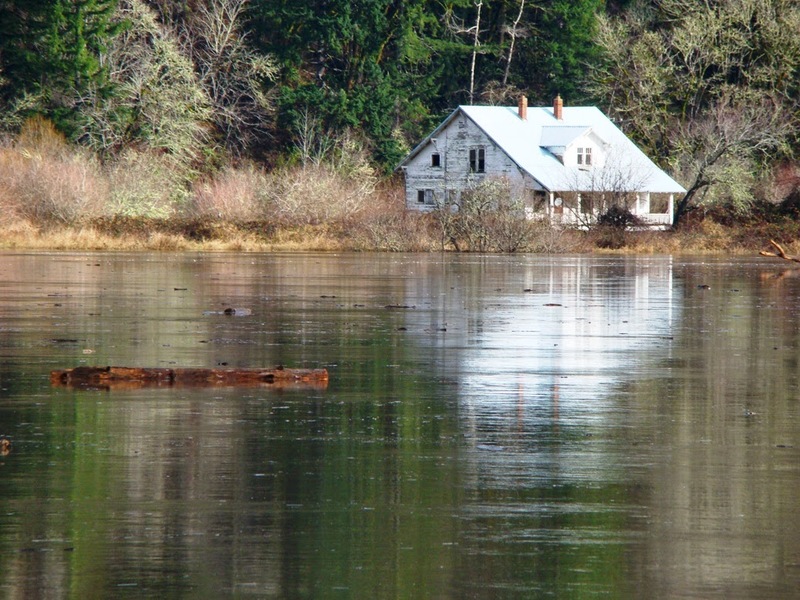 And that extraordinary flood was barely more than half what I saw today on our journey down the Umpqua River to the coast. I just don't often see rivers this big, or filled to this level. So my two hour drive turned into a four hours as we stopped to take pictures and stare at the flooding river. It was clear that trees (and the odd telephone pole or railroad tie) were ripped from banks upstream. There was a lot of debris in the river. 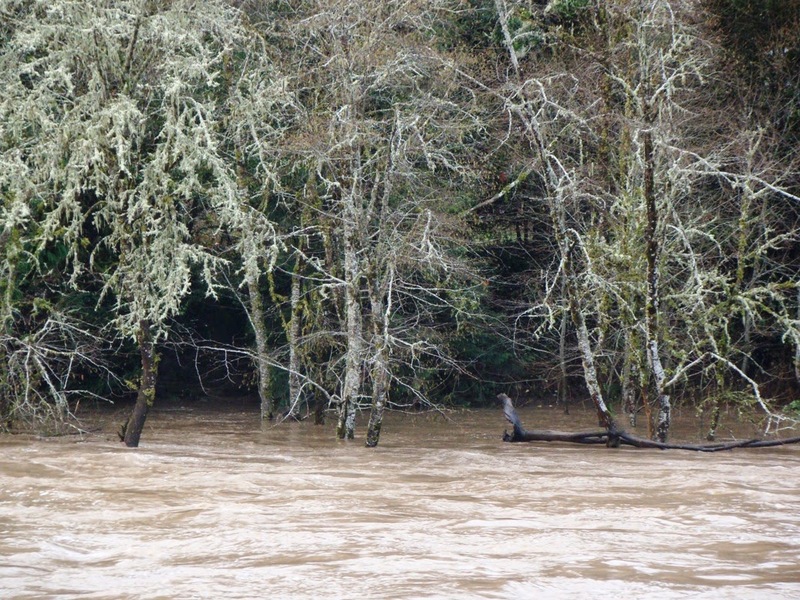 Roseburg had received about two inches of rain the previous day, but the mountains upstream got much more than that. The ground was no doubt saturated from the rains of the previous week, so much of the precipitation ended up in the river. A flood hydrograph, like the one above, is the tool that hydrologists use to analyze river flow and to predict possible flooding. It takes some time for rainwater and snowmelt to get into channels and flow downstream. By comparing the pattern, timing, and amount of precipitation in a given storm compared to storms of the past century (most U.S. rivers have been monitored for that long), they can predict hours in advance how high the floodwaters will reach, and for how long. For major rivers with huge drainage basins (like the Mississippi River), the warnings can be days ahead of the flood. 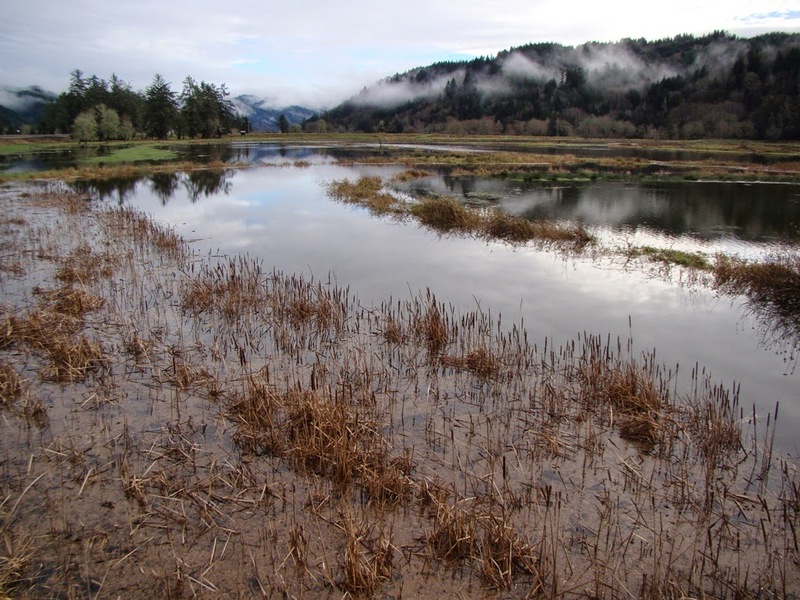 The Umpqua River flows into a large estuary at Reedsport, Oregon, and just upstream is a Roosevelt Elk viewing area. I would never have noticed such a thing on any other day, but the highway was actually a flood protection levee that prevented the river from flooding the meadows where the elk hang out. Driving along, I could see the Umpqua River just a foot or two below the level of the highway on the right, and the elk refuge on the left, about six or seven feet below river level! There was certainly some ponding as can be seen in the picture above, but if the highway weren't there, the entire scene above would be under at least four feet of water. So this was a minor flood in the big scheme of things, barely rating mention in the local media. 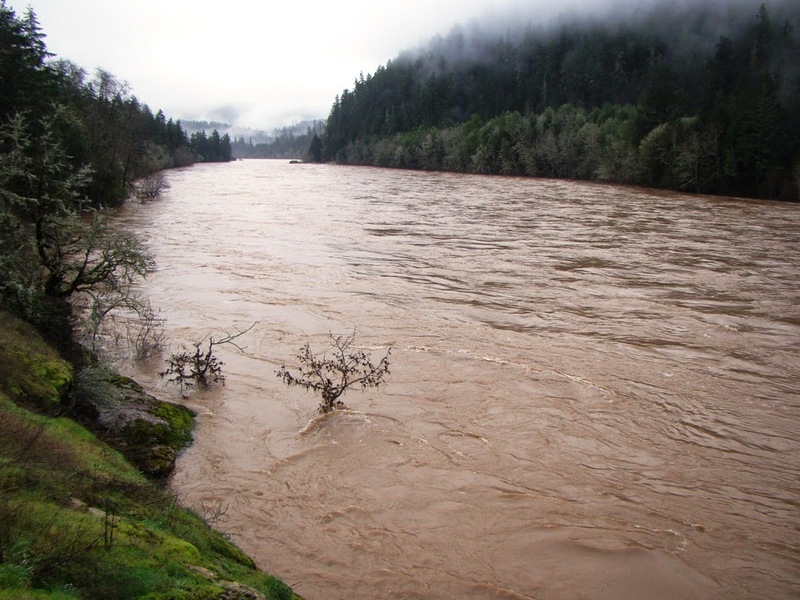 If you wonder what would really get their attention, how about the greatest flood ever recorded on the Umpqua River? It began on this very day fifty years ago, and the amount of water reached at least 260,000 cubic feet per second, about twice the flow of today's event. It's hard to even imagine. So...your desert-living geoblogger got to get all fascinated about a river today. More rain is expected this week. If anything interesting happens, I'll let you know, and all my Pacific Northwest readers can quietly chuckle at my amateurish enthusiasm for BIG rivers. 1862, sorry. Huge flood that even formed canyons in San Diego!